Rugby Racing Cycling Club held their annual awards night at Arnold House in Rugby on Friday and, apart from an excellent evening with good food and entertainment, 80 members and guests enjoyed the presentation of trophies to the winners of the various categories in their 2018 racing season. This year the club had 99 members across first and second claim, of whom 79 took part in one or more club events. 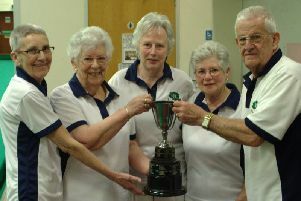 26 events were held in total including the Interclub challenge with Rugby Velo, which they won for the first time in 12 years, the club Open in July, which attracted over 120 competitors, and three Sunday events. In total there were 824 rides which was the highest in the Midlands district. Val Saitch and Edith Hastie, the club’s wonderful refreshments stalwarts who attend every event come rain or shine. Andy Craig, winner of overall TT series, best all-rounder and 40-49 age category. Angus Gordon, winner of 60-69 age category. Ben Leugs, best junior on overall TT series. Caroline Read, fastest woman 2 x 25 mile TTs. Chris Orfeur, winner of TT series on handicap. Dave Elliot, fastest 4 x 10 mile TTs and new club captain. David Kimberley, winner 50-59 age category. David Wright, best newcomer in first season. Eleanor Humphries, winner of overall women’s TT series and fastest 4 x 10 mile TTs. James Garrett, Steve Whitington and Jon Cottingham received the Interclub Trophy on behalf of Rugby Velo. John Brothers, President’s Cup for contribution to the Club. Mike Smallwood, winner of over 70 age category.